The process of designing a garden is usually private, done by the garden designer alone or in intimate discussions with the owner. As a result we see the finished product, not the initial vision, issues, or trade-offs. Front facade of Dumbarton Oaks comes into view after a curved drive. Dumbarton Oaks, also known as the Oaks, is a house and garden created in the Georgetown section of Washington, DC in the arts and crafts style. It is a signature space that embodies the work of Beatrix Farrand. Farrand, one of the greatest American garden designers, was a founding member of the American Society of Landscape Architects. Her work was limited to private homes and private universities because only men had access to public projects. 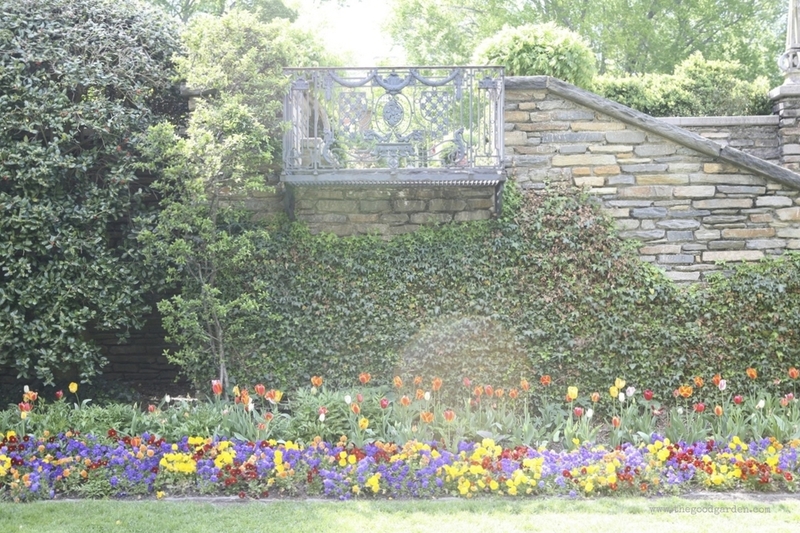 We get a unique glimpse into the creation of this wonderful garden because so much of the process was captured and saved in correspondence between Farrand, client Mildred Bliss, and architect Lawrence White. This garden was designed in letters because Bliss was living in Sweden and Argentina with her diplomat husband during the building process in the 1920‘s. Also, Farrand wrote Plant Book for Dumbarton Oaks in 1941 as a guide to help maintain the garden. In it she shares the rationale behind the design, the plant lists, and the maintenance instructions. Through both of these we can experience the thought process behind the garden, and get ideas for our own gardens. Reading the letters today is like peering into a long savored conversation, with each party’s ideas well thought out and explained, and with long pauses in between for reflection. It’s hard to imagine a professional as accomplished as Farrand using such a self-deprecating tone. If I had just an afternoon with Beatrix Farrand in my garden I would want to know her “suggestions and jottings.” I am sure they would be brilliant. A version of this post was originally posted in 2015.